← Skin Care Problems? We Can Help! The first thing you can do is to squeeze blackheads on nose gently. A dermatologist or beautician will be able to give you advice and treatment on how to prevent future blackheads, but in the meantime, a good way of dealing with them is this. Gently steam your face to open your pores and pat dry with a clean towel. Wash your hands. Use a clean handkerchief or tissue between the tips of your fingers when you squeeze the blackhead and this will ensure that your fingers do not slip as this could cause damage to your skin from your fingernails. This is an effective way of removing blackheads but if the blackhead will not pop out with gentle pressure, do not persist as bleeding and/or bruising could result. Another way to get rid of blackheads on your nose is to exfoliate. This is a great way of doing it as it is gentle, will remove dead skin cells from the surface that would otherwise clog the pores and lead to further blackheads. It will also have the effect of reducing pore size which will also inhibit the development of more blackheads. Be sure not to overdo exfoliation though as you could make your skin red and sore. You could use a blackhead removal tool and there are quite a few on the market. Be sure that you know how to use it effectively before you start as like squeezing, these tools can lead to bruising and bleeding. 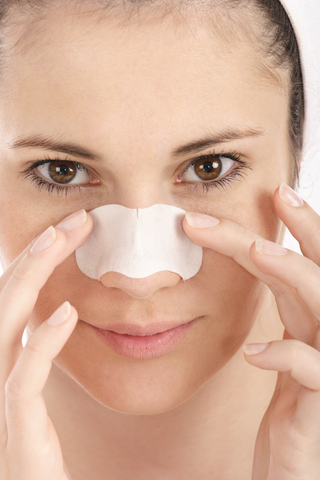 Finally, the most popular tool for treating blackheads on nose are pore strips. Make sure you always apply these to clean, dry skin and use in accordance with the instructions on the pack. If you are unsure whether you may react adversely to the adhesive in these pore strips, apply one to the inside of your elbow, leave for the required time and remove. If no soreness or redness has developed by the following day, go ahead and use the pore strips on your nose – better safe than sorry!